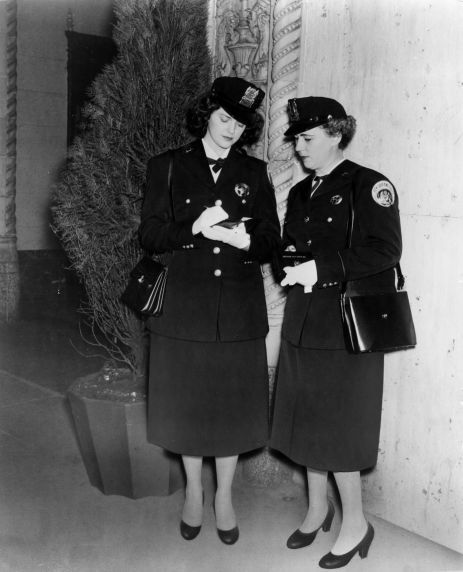 "New Orleans, La., policewomen are shown wearing new uniforms of a tropical weight fabric of "Dacron" polyester fiber and wool. The ability of "Dacron" to hold a press in humid weather in such cool, lightweight fabrics makes it particularly suitable for the Gulf Coast city. Cities which have adopted summer uniforms containing this modern fiber have had proof through actual wear that they wear longer than heavier uniforms of traditional fabrics and have a reliably neater appearance."